Reviva Labs September Summer Skincare Giveaway! First, let me announce that the winner of our Sweets for Feet Giveaway is Jennifer! Please contact me at mej0620@hotmail.com to arrange delivery of your prize! Congratulations to her, and thanks to all who entered. WINNER ANNOUNCEMENT: OCTOPUS818/Lisa is the winner of the Reviva Labs Summer Skincare Giveaway for September! 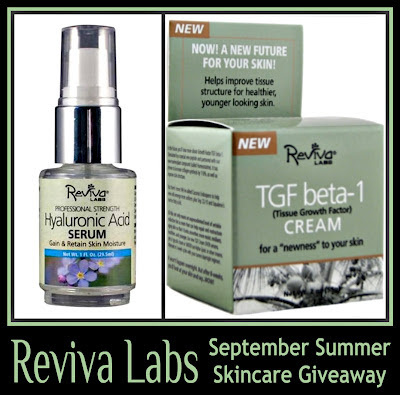 Today we have the final Reviva Labs Summer Skincare Giveaway! Each month for the last six months, Reviva Labs has been featuring their Summer Skincare Giveaways on several blogs. The product prize duos for each month have focused on caring for your skin, from prepping it for the warmer months, to hydrating and protecting it throughout the Summer heat, and finally, to repairing and renewing your facial skin for the upcoming dryer, cooler weather. 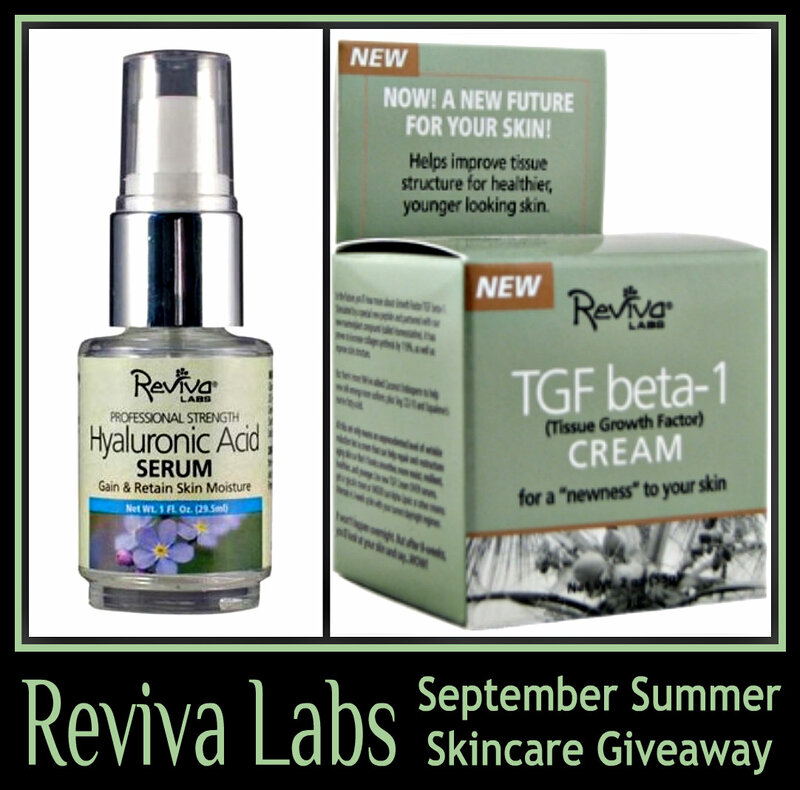 This month, one random winner will receive Reviva's Hyaluronic Acid Serum, and their TGF beta-1 Cream. Read on for more information about these useful products! I've been using Reviva's Hyaluronic Acid Serum for over a year now, and it is a staple of my facial skin care routine. I apply this as a serum after cleansing, followed by my moisturizer. This product can also be used alone. Here is the product description: Reviva Labs has now compounded a higher level of premium Hyaluronic Acid into a precious fluid that can help raise skin's moisture level to fill-in furrows, plump up tissues and tone-down lines. Apply under creams in the evening or alone to hydrate skin. If also seeking firmness, alternate with our DMAE Firming Fluid. Benefits: Unlike products that depend on moisture in the air, HA can help hydrate skin even in dry climates or heated rooms that rob skin of moisture. The results I receive from this product include diminished fine lines around my eyes and lips, skin feels soft and hydrated, and skin texture is even without any dry or flaky areas. In addition to applying it around my lips to help with fine lines, I recently began applying it directly on my lips, and I do believe it plumps them up just a bit. There is absolutely no greasy feel to this, and it absorbs instantly. One pump is all I need, so a litle goes a long way. The TGF beta-1 Cream is a moisturizer designed to improve the tissue structure of your skin. By increasing collagen systhesis by 119%, this product can help your skin regain some of the lost collagen that has been diminished due to the aging process. Reviva Labs recommends using this product in 2-week cycles, so I've been utilizing this as my moisturizer applied over either the Hyaluronic Serum or some other serum I may be testing, for two weeks. I then switch to another moisturizer for 2 weeks. It's a light cream formula with no scent, there is no greasy residue, and it absorbs very quickly. If you need a heavier moisturizer, you can apply this product as your serum, followed by a moisturizer. Reviva's Collagen Regeneration Cream is distinct because it both repairs damaged cells and stimulates new collagen. So current imperfect collagen is "corrected" and new collagen flourishes. This renewed collagen combination boosts moisture, improves tissue structure, helps reduce the appearance of wrinkles, and enhances overall skin tone and texture. What's more, our rich blend of ingredients, including the potent antioxidant CoQ10 helps protect against future damage. Collagen Regeneration Cream can be used alone or "layered" over various anti-aging serums or combined with other anti-aging treatments in your beauty regimen. You can view all of the ingredients for both of these products by clicking on the product links above. Reviva Labs is a cruely-free company, and uses all natural and organic ingredients. ENTRY DETAILS: One lucky follower will be selected using Random.org to receive both of these products. If you'd like to enter, just leave a comment with your eMail below. If you aren't comfortable leaving your eMail address, be sure to check back on October 1 when I announce the winner, and we can make contact. Contest ends at midnight EST on September 30, 2012. U.S. residents only, as prize package will be sent to you directly from Reviva Labs. *Products featured for review and product prize package furnished by Reviva Labs. I've been wanting to try both of these products for the longest time. Thanks for the opportunity Mary (and Reviva Labs!). I have heard great things about these products. Hope I win! I have heard of these, but never tried! Thank y u for the review and giveaway. I haven't tried these Reviva products but all the others I've tried, I have loved so it would be great to win these. Would really like to try these! What a lovely giveaway! I use and really like the serum and am almost out - so timing is perfect. Thanks! Would love to try this as I am liking other items from this line! I would love to try I love most green beauty products like earth essence I would love to see if reviva is good for my skin thanks for the giveaway! Great giveaway. I would love to win these. Reviva is a great brand. Reviva makes wonderful products!! I would absolutely love to win this giveaway! I'd love to try these! my skin needs all the help it can get! thanks for the giveaway! I don't believe I've seen this line in store, but both products sound wonderful! I have my eye on the Hyaluronic Acid Serum!